Phil Fernandez, Belen development director, applauds the Zumpano family seated beside him, from left: Daniel, Rosana, Joe, and Carlos. 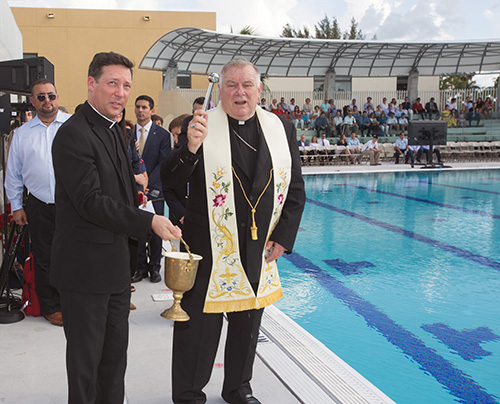 MIAMI | Archbishop Thomas Wenski sprinkled holy water on the newly-opened Gian Zumpano Aquatic Center at Belen Jesuit Preparatory School just as a passing rain cloud sprinkled water from above into the Olympic-sized and beginners’ pools. East of the center, above the speaker’s podium, a rainbow appeared in the sky. He noted that he and Gian, ‘86, had started the swimming team at Belen in 1983. Their brothers, Dan, ‘91, and Carlos, ‘92, were swimming team members. “This center carries an echo of Gian,” Joe Zumpano said. Belen had a swimming pool, but it wasn’t adequate to host swimming competitions, said swimming coach Kirk Peppas, who has coached the Belen team for 30 years, winning seven state championships. 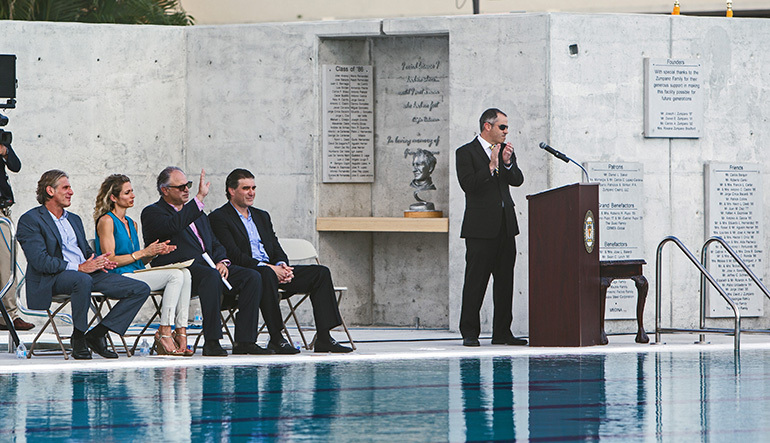 Archbishop Thomas Wenski blesses Belen Jesuit's new Gian Zumpano Aquatic Center. The old pool was in great demand, said Joe Zumpano. 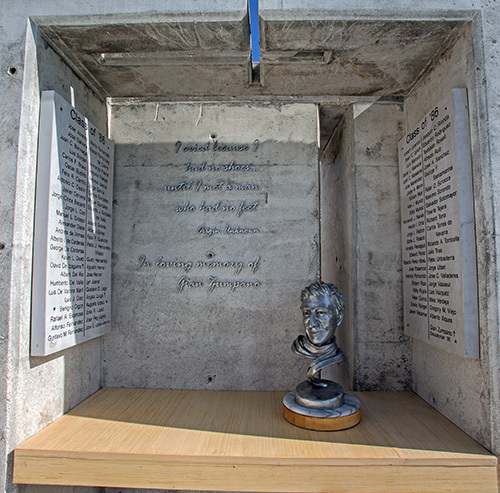 View of the grotto with Gian Zumpano's bust and reflecting cross on top wall of grotto at Belen Jesuit's new Gian Zumpano Aquatic Center. Zumpano brothers Joe, Dan and Carlos, along with their sister, Rosana, attended the dedication ceremony June 6. Joe, Dan and Carlos went on to swim for Harvard. Rosana swam for Carrollton School of the Sacred Heart in Coconut Grove before attending the University of Miami. Gian was the class of ‘87 valedictorian. He attended another Jesuit school, Creighton University in Omaha, Nebraska, where his father attended medical school and met Rose, Gian’s mother. She taught high school in Omaha. The aquatic center dream had been floating around for a long time, said Belen’s president, Jesuit Father Guillermo Garcia-Tuñón. The Zumpano brothers are all attorneys and Rosana is a legal administrator. They contributed a significant amount of time and money to the project, along with donations from others. Father Garcia-Tuñón, Belen class of ‘87, knew Gian Zumpano, who was one year ahead of him. 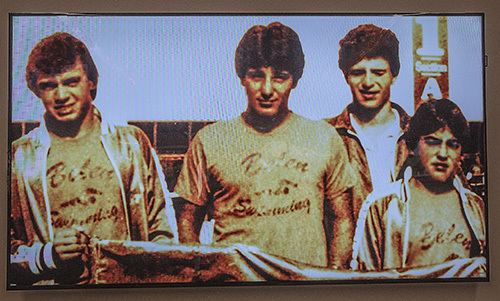 A photo from the 1980s of Belen swimmers Jorge Baste, Gian Zumpano, Joe Zumpano and Henry Artalejo, seen during a video presented at the dedication of Belen Jesuit's new Gian Zumpano Aquatic Center. 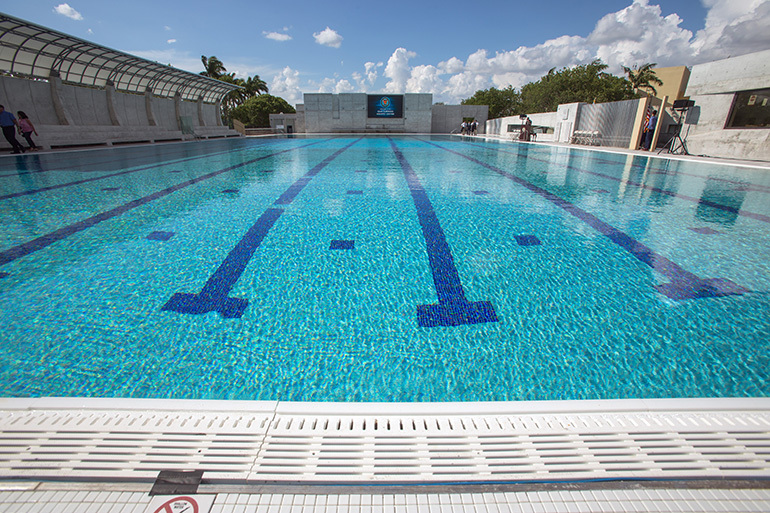 Beginning swimmers will use the small, narrow pool beside the Olympic pool to learn to swim. Swimmers competing in meets can use it to warm up and wind down before and after a competition. A window for spectators lines the narrow pool. It starts out wide on the north side then tapers down on the south side. The canopies over the spectators’ bleachers are blue and white, like Mother Teresa’s habit, he said. The amphitheater seats are acoustically-designed so that the cheering audience doesn’t distract the swimmers. The pool is designed for hydrodynamics. And there are underwater speakers that swimmers can hear. Some elements of the aquatic center still remain to be completed, but summer camp is starting and children in the community need the facility. The area occupied by the old pool will be filled in with a garden and signature trees representing Jesuits who have taught at Belen, said Medina. The garden will be called the Arroyo Quad and contain a statue of St. Ignatius of Loyola. Archbishop Wenski thanked the Zumpano family for memorializing Gian with the aquatic center. “This is a good work that has been done here in the Jesuit tradition,” he said. The Jesuits founded Belen in 1954 in Havana, Cuba. In 1961, the Castro regime confiscated Belen and all private schools. That same year, Belen was reestablished in Miami. The school has a capacity for 1,500 male students in grades 6 to 12 and has more than 6,000 alumni. View of the Olympic-size pool at Belen Jesuit's new Gian Zumpano Aquatic Center. Editor's note: This article been corrected since its publication. It originally said Gian Zumpano pursued admission to Harvard but his brothers cannot recall that; and his sister, Rosana, attended and graduated from the University of Miami but only swam for Carrollton.